On February 14, Ambassador Liu Xiaoming met with the Rt Hon Jeremy Wright, Secretary of State for the Department of Digital, Culture, Media and Sport and exchanged views with him on China-UK people-to-people and cultural exchanges. Ambassador Liu said that at present, China-UK relations are moving forward, and the people-to-people and cultural exchanges between the two countries are full of highlights. Last year, “China’s First Emperor and the Terracotta Warriors” was successfully held in Liverpool, and the number of visitors hit a historical record. The two countries have opened more direct flights, facilitating more than 1.5 million trips last year. China-UK cooperation in the fields of cultural creativity, fashion, tourism and sports has yielded fruitful results. He hoped that the two countries would work together to further deepen such exchanges and cooperation so as to make the China-UK “Golden Era” strong and enduring. Wright fully shared Ambassador Liu’s view, saying that Prime Minister May’s successful visit to China last year injected new impetus into the bilateral relations and the people-to-people and cultural exchanges and cooperation between the two countries. The UK welcomes more Chinese tourists to Britain and will provide better services, Wright said and added that he personally attached great importance to strengthening the exchanges and cooperation between the UK and China and looked forward to visiting China in the first half of this year and contributing to the expansion of the people-to-people and cultural exchanges and cooperation between the two countries. 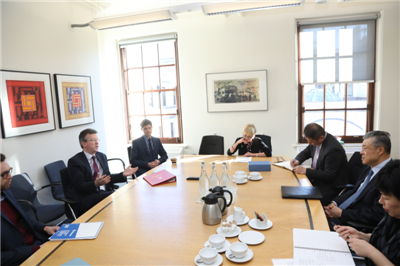 Permanent Secretary Dame Sue Owen and Foreign Affairs Director Keith Nichol for the Department for Digital, Culture, Media and Sport, Minister Chen Wen and Xiang Xiaowei, Minister Counsellor for Culture, of the Chinese Embassy in the UK, were present.